Eventually, everybody is going to experience a flat tire. Flat tires are easy to fix, though you probably don’t want to be learning how to do this on the road in a real life scenario. Instead, do it from the comfort of your own driveway a few times to get some experience, and to make sure you have all the right tools. Always try find the source of the flat tire before putting in a new tube. If there’s something sharp in your tire, it may still be there and may puncture your new tube. CAREFULLY run your finger along the outside and inside of the tire to find anything sharp that may have caused the puncture. It’s not always something sharp, as hitting a pothole can cause a pinch flat. Find the hole in the punctured tube. Verify what you have determined to be the cause of the flat by locating the puncture in the tube, or you may determine that it was a pinch flat, which would mean that there’s nothing sharp involved. Just hard bump like hitting a rock or pothole. If you have an air pump, you can pump it up and look for the hole. If you found something sharp in the tire, match that up to the same spot on the tube. How can you do this? See the next tip. Always line up the tire in the same place on the rim relative to the air stem. I always put the brand logo of the tire centered on the stem. This way you always know the exact position of the tire relative to the tube to help find a puncture. If you can, repair the tube. A tube repair takes only a few minutes, and a patched tube is just as good as a new one. Save your spare tube for the next flat, which could be right around the corner. Or even right after you inflate the tire if you failed to find the sharp object in your tire the first time around. At least keep the old tube, just in case. Be careful with the tire levers. You can cause a pinch flat being too aggressive with tire levers either getting the old tire off, or the new one on. I prefer to use just one lever to get the bead over the rim when taking the tire off, and none at all when putting the tire on. But some tire/rim combinations are really difficult. Getting the tire off and back on the rim is the trickiest part, and this is the part where experience in your driveway with some dry-run tire changes can really help. Make sure you have the right size spare tube. There are lots of different tube diameters, and even widths. If you have 700×25 tubes, you can go up or down a bit on the width, but too much extra width can prevent you from even getting the tire on the rim, just because of the extra rubber in there. Get familiar with your drivetrain. Putting the back tire back on a bike can be an exercise in frustration if you don’t know how the pieces fit together. After countless times removing the back tire from my own bike, I still have to take an extra few seconds to remember how I need to move the back derailleur to get the wheel to fit back in. Get help from an experienced friend. It’s great to see someone change a tire with confidence to see how easy it really is. Get a friend to show you how to do it. Preferably at home and not out on a ride. But it sure is great to have a friend there with you when you have a real-life flat. 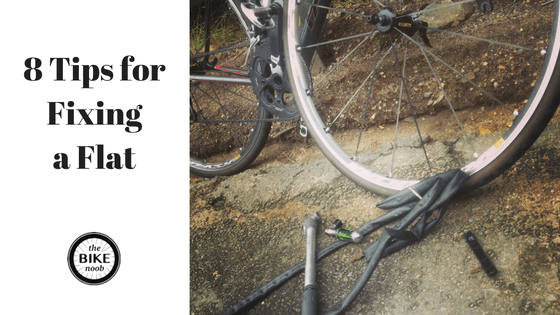 With some planning and practice, mechanical issues like a flat can be just part of the experience, rather than a ride-ender. 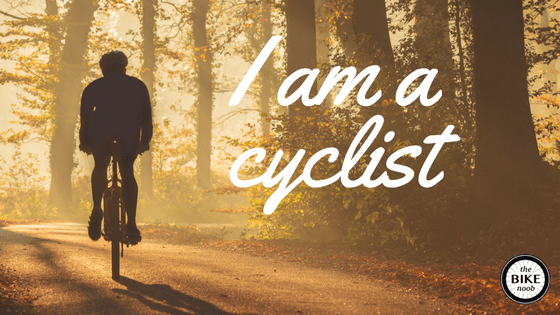 When can you call yourself a cyclist? A friend asked me this the other day. He’s a runner, and just got himself a road bike. We live 2000 miles apart, but we pledged to get together to do the Triple Bypass ride in Colorado next summer. 120 miles and 10,000 feet in climbing over three mountain passes. That should keep us going on the trainer over the winter. The legs thing was a joke, but it implied that there’s some rule. And I think we all feel it when starting out, that we’re not yet part of The Club. So what is it that makes you a cyclist? An expensive bike? lots of lycra? a 30 mile ride? a century? An endo? Road rash? Near death by angry motorist? 19mph average? a Strava account? There are people who put their own judgment criteria on a question like this. But so what. If you’re driving a car, you’re a motorist. If you put on running shoes and go for a loop, you’re a runner. If you walk across the street, you’re a pedestrian. If you watch a football game, you’re a spectator. If you jump on a bike, you’re a cyclist. There are fast ones, slow ones, timid, and bold, kind ones and jerks. But if you get on a bike and enjoy it, you’re a cyclist. I’m in The Club, and officially, you’re in. Congratulations. Your card is in the mail. Don’t let someone else’s elitist attitude or douchebaggery keep you from getting out there with others, having fun, getting in shape, or even competing. What’s a gruppo or groupset in cycling? When searching and shopping for your next (or first!) road bike, you’ll probably come across the term “Gruppo”. In cycling, gruppo is another word for groupset, which is all of the mechanical parts that make up your drivetrain and brakes. Gruppo is an Italian word, which just means “group”, but it’s become an actual word for groupset in cycling. When you purchase a groupset, you typically get brakes, shifters, derailleurs, bracket, crankset, and cables. Besides the frame, the gruppo is a big part what defines the quality and value of a bicycle. 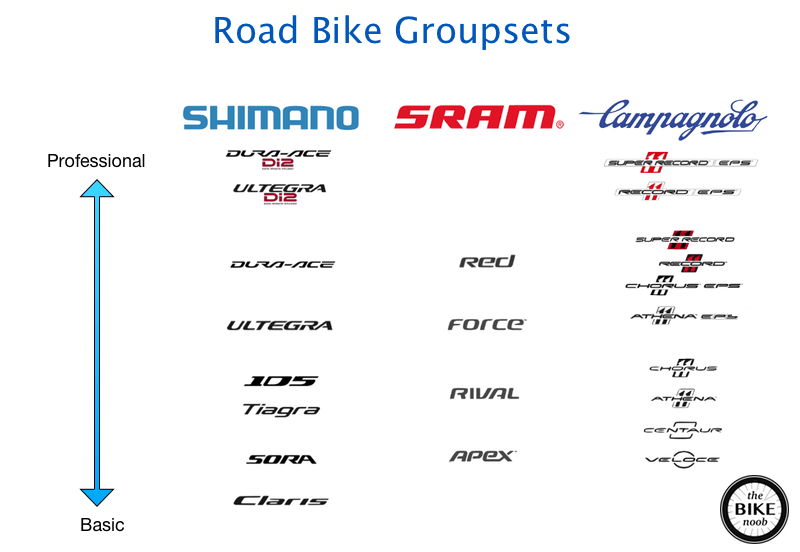 There are three main manufacturers of groupsets, namely Shimano, SRAM, and Campagnolo. Each of them has different price points for their groupsets with increasing cost for performance and weight. For example, Shimano has many levels from low to high: Claris, Sora, Tiagra, 105, Ultegra, and Dura-Ace. And when you’re purchasing a bike, paying close attention to which groupset is on the bike will give you good idea of it’s overall value, from entry-level to pro. Which gruppo should you choose when buying a bike? That’s a whole topic in itself, and there are many pros and cons of each. As well as personal preferences. They all have their own feels, construction, and shifting models, and you should definitely try them all out to determine which is best for you.